Like my Germans I did last year my plan was to do five sections; the standard three in the core platoon, a spare one to use a support choice, and a dug in one. I’ve found it’s unusual to have more than one section and some support weapons dug in during a game. I’ve done 11 men in four 2-man foxholes and 3 with only one man. That gives men enough flexibility to have a three-man Bren team, the section commander, and enough other guys to make a rifle team up to seven strong (as late war Kiwi sections were). The single guys are to allow casualty removal without needing tokens. I’ve amended my technique slightly from when I did my dug in Germans. For a start, they’re on smaller bases. 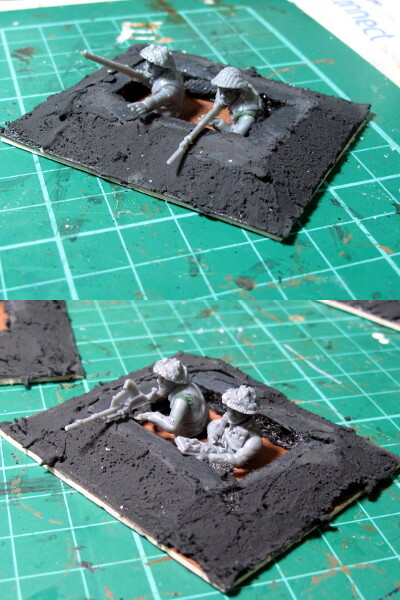 I went for 6x4cm this time and built them lower, as I felt the German foxholes were a bit big. They take up lots of storage space and lots of room on the table. I started with a 6x4cm rectangle of cardboard and added a single layer of 5mm foamcore. I then cut each trench into the foamcore with a sharp blade and contoured the edges back with a serrated knife to give a gentle slope. The whole lot got slathered with gloop. I was going to use filler, but mine had tried up. Not to worry, I had a massive tub of black grout so slapped that on and it worked fine. It’s a lot harder than filler, hopefully the copious PVA I applied at the next step will prevent it from chipping. Cardboard + foamcore + grout = protection from anything Nazi Germany can throw at you. The figures themselves are from the Warlord late war British plastic box, which is a hugely versatile kit. I assembled the arms and heads, then started matching them up to the foxholes. Once I was happy with how their arms and weapons matched up with the edge of the trench I cut the poor little fellas in half with a razor saw. I then stuck all the troops to some coffee stirrers for painting. I normally just handle my miniatures by the base for painting so I don’t have a big stick that I always glue things to when I paint them. It’s surprising how little time you save when only painting half of each man. Painting these guys actually took about the same time as a normal miniature. All the detail is in the top half of most miniatures, I mean how long do you really spend painting boots? The bases got slathered in neat PVA then dipped in sharp sand with lots of nice bits of rocks and general corruption. That got sprayed light brown, given a burnt sienna ink wash and a couple of drybrushes. I flocked with static grass using my new homemade high voltage deathtrap, and made some revetting for the inside of the foxholes out of Hobby Material #1 (coffee stirrers). The Warlord infantry box has lots of nice gubbins like shovels and picks, plus I chucked in a few extra grenades, ammo boxes and the like as eye candy. Excellent idea and work Andy, I saw your early work on your dug in German Infantry a while back and thought it was a great idea, portraying dug in troops like you have looks more realistic on the gaming table. I hope you don’t mind I’ll will have to pinch your idea and make some up for my Brits, thanks for the inspiration and sharing info. Given your excellent conversion efforts on the rest of your platoon John, I’m sure yours will put mine to shame! Not my idea though, I think I first read it in one of Phil Barker’s old WRG rulesets! Great work with those dug-in British. I think the figures are just fine, as I look at them they’re posed such that they’re on the look-out and have just spotted the first enemy. Might have to pick up a sprue or two from Warlord. 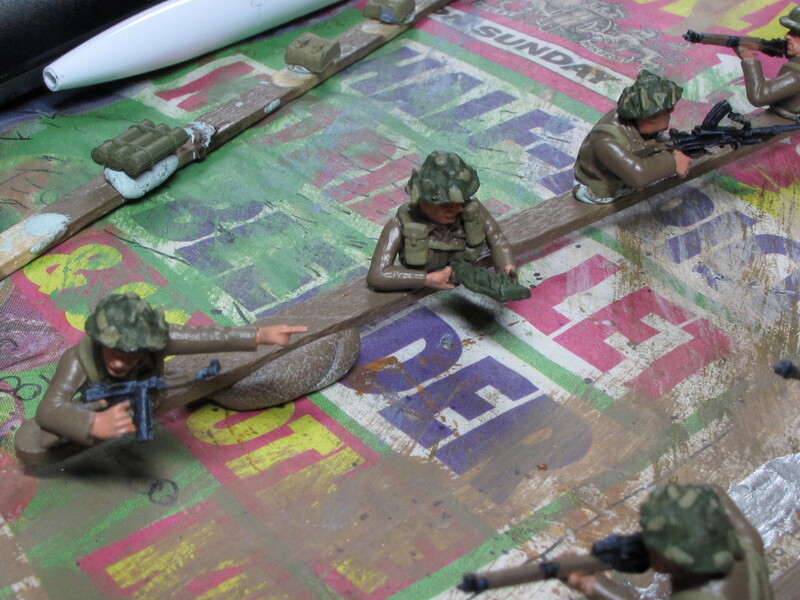 For dug-in troops I currently have to use regular figures stood behind some hefty sandbag resin pieces – does the trick but just doesn’t quite look ‘right’ if you see what I mean. I posted them on the SOTCW forum and someone said similar about the “wall of sandbags” approach. He said he thought it made them look like black powder-era troops behind gabions, which is a fair point. Warlord occasionally do their half-price sprue sale, although the last one was only a couple of months ago I think.